Need to whip up a festive 4th of July dessert in a jiffy? Never fear! Poor Girl is here! Here are some quick dessert ideas inspired by Martha Stewart (who else?) 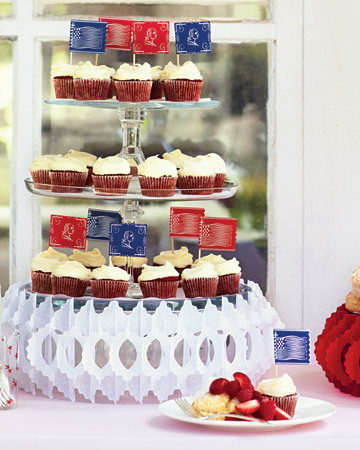 to get your guests in the patriotic spirit. And don’t worry, these desserts are truly ‘quick and easy’, we’ve put a Poor Girl twist on the recipes to make sure they’re cheap, quick and no fuss! You won’t find a cake in the likeness of Uncle Sam on this list! With a box of Duncan Hines cake mix, cream cheese frosting and $1 store American flag toothpicks, you can create festive cupcakes in no time! Sorry Martha, we’re using the box! How cute are these? 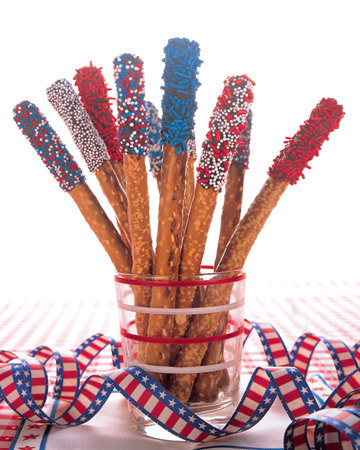 Give your chocolate covered pretzels some 4th of July spirit with blue and red sprinkles. Placing them in a jar or wine glass can also help add to your table decor! Everyone loves an edible centerpiece. Can it get any easier? No cooking, no chopping = quick festive fruit salad. 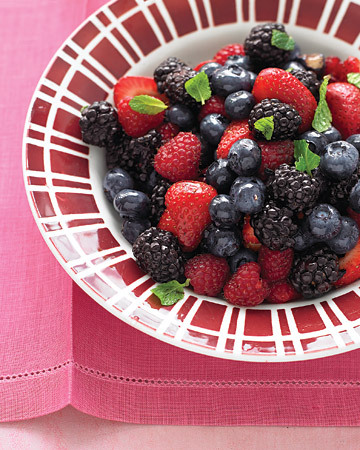 Using only red and blue berries (blue berries, raspberries, strawberries…you get the hint) this fruit bowl is good for your waistline and your color theme! Need a 4th of July punch? Check out this recipe for cranberry punch with blueberries!